Ho Hum! It’s February in Seattle, and that means it’s a bit grey and a bit rainy. The crocuses are just beginning to stick their purple heads above the ground promising that Spring is not far off. I’m so craving COLOR! Vibrant Spring colors! Rainbow colors! and sunshine. Then I saw it! I wasn’t even sure it existed. 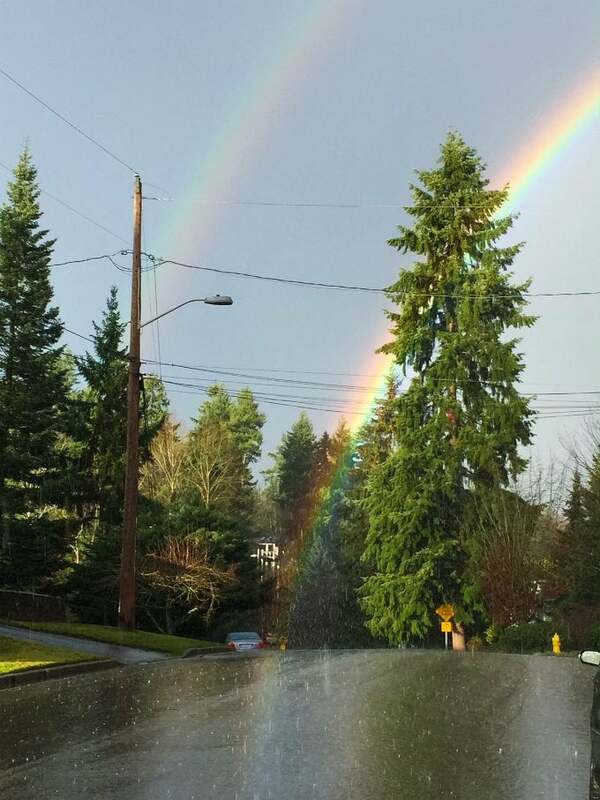 The end (or beginning ) of the rainbow! Whoa! Whoa! Whoa! How cool is that…right there in front of me..the rainbow seemed to end or is that the beginning? I pulled over and jumped out of the car to snap this pic! (you can see it’s still raining..just look at all those raindrops jumping off the pavement). 2 minutes later…back to crazy rain…rainbow gone. Guess my vibrant colors are going to have to come in salad form for a few more weeks until the sun comes back and the Spring flowers are in full bloom. 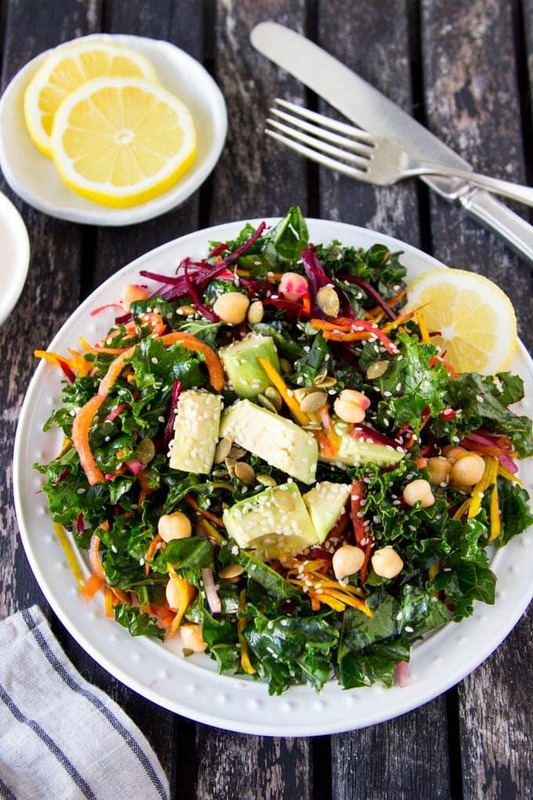 How about a “rainbow” Kale + Chickpea salad with some creamy Lemon Tahini dressing? 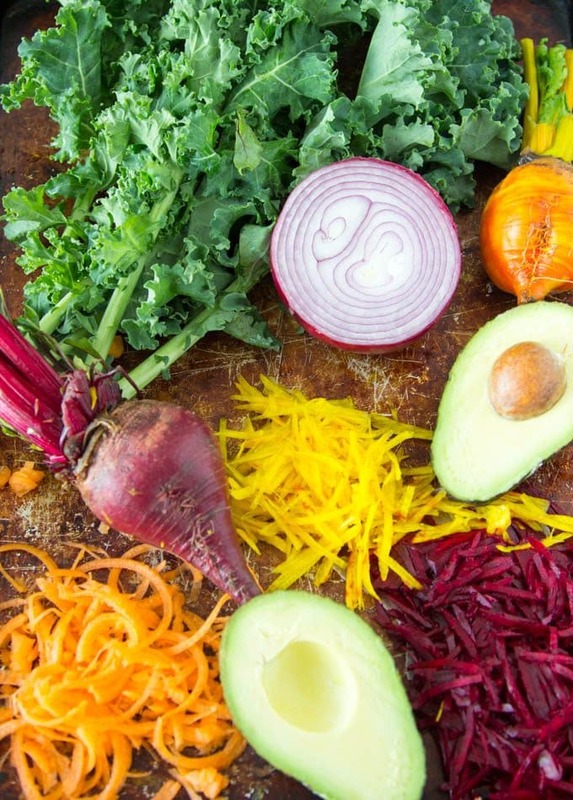 Chock full of vibrant veggies like fresh grated red and golden beets, carrots, sliced red onions and avocado and crunchy sesame seeds and pepitas. In hindsight I should have thrown a handful of blueberries in there as well to complete the “rainbow”. If you have some…do it! the touch of sweet berries would be amazing with the earthy beets and tangy lemon tahini. I “messaged” the kale for a few minutes with some lemon juice, olive oil and sea salt. I know, I know…”massaging” kale seems like a strange thing but it really does make a big difference! Massaging the kale helps to make it a little softer (and I think a little less bitter) plus the bonus of having every leaf coated with a hint of lemon, olive oil and sea salt just makes this salad taste that much brighter. 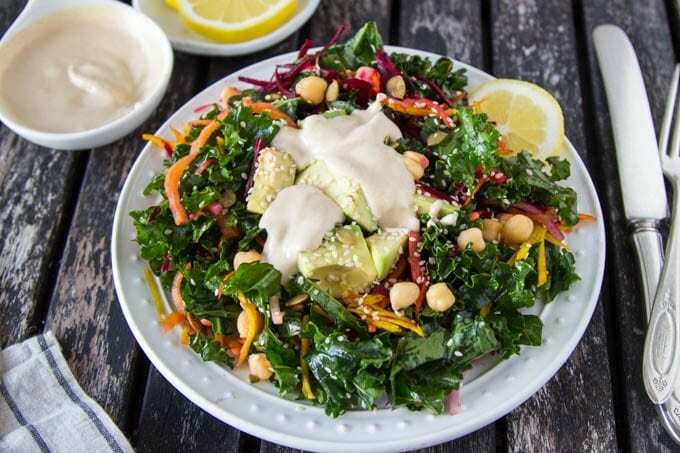 The Kale + Chickpea salad gets topped off with a creamy tahini (a Middle Eastern paste made from ground sesame seeds- which you should be able to find at most well stocked grocery stores) dressing. 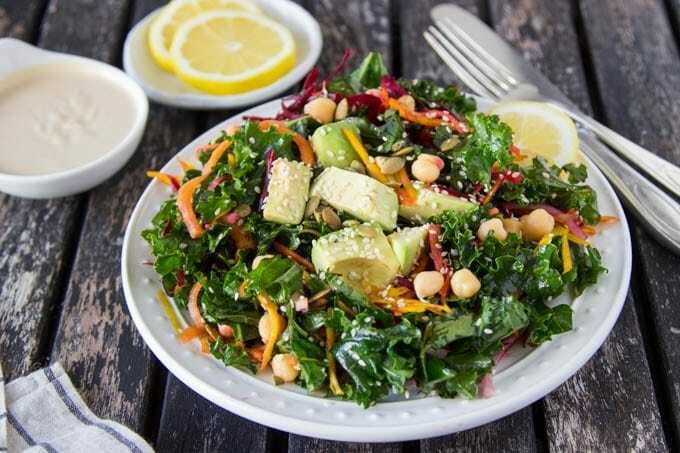 It’s made by mixing tahini with fresh lemon juice, a pinch of sea salt and a splash of honey/agave (you can throw in a little garlic too if you like) for a creamy blend that enhances all the flavors of the veggies in the Kale + Chickpea salad. You could also substitute hummus for the tahini if you are unable to find tahini. Smiling…it’s hard not to when a big plate of vibrant veggie goodness is sitting right in front of you. Wash and dry the kale. Remove the ribs from the kale leaves by running a paring knife along the side of the ribs (like a big V) . Chop the kale into bite size pieces and place in a big bowl. Add 2 tsp lemon juice, olive oil and sea salt. "Massage" the kale with your hands until it begins to soften up and turn a bright green (about 3-5 min.). If serving salad on separate plates or bowls divide kale now. In a small bowl, whisk together all salad dressing ingredients except water, add water slowly until you reach your desired dressing consistency. Top each salad with dressing.